Whether you’d like to upgrade your current eReader or you want to purchase your first eReader, finding the perfect device can be tricky. Both Kobo and Kindle eReaders have excellent reviews and many similar features, but which one is right for you? We narrowed down the top 3 devices from each brand to help you decide which eReader is right for your library, reading habits, and budget. Amazon’s Kindle eReaders have access to millions of titles through the Kindle Store, which offers plenty of free and inexpensive books. 1) They own a publishing unit named Amazon Publishing (or APUB) with many imprints. APUB has published many thousands of books which are only available on Kindle. 3) Amazon offers publishers and authors certain incentives for publishing their ebooks exclusively on Amazon. For these reasons, Amazon has far more eBook content than Apple, Kobo or B&N. Kindle is the undisputed king of free books. At any given time there are 50,000 to 80,000 free books. Why does Amazon have more free books? They incentive authors and publishers to “price” their books at free exclusively on Amazon. Reader’s who browse Amazon’s free book selection are often amazed at the quality and depth of selection. With Kindle eReaders, you can listen to any audiobook from audible. But before you get excited about that, here’s the catch, you can only listen with Bluetooth speakers or headphones. There is no speaker on the Kindle e-ink devices, and there is no headphone jack. If you pay the yearly prime membership, you have access to 1000s of free books and magazines through Prime Reading. Amazon describes its Prime Reading collection as a “private library that lets Prime members read free.” The free titles include everything from nonfiction to guilty-pleasure reads and literary classics. Prime members also get to pick one free book per month. Typically these are books published by Amazon Publishing. The current selection of First Reads is located here First Reads on Amazon.com. For those who read many books a month, you can subscribe to Kindle Unlimited and get all the books you can read for $9.99 a month. Along with books, the Kindle store also offers magazines, comics, graphic novels, and audiobooks, so there’s a wide range of content for readers of all ages and interests. Amazon allows you to loan books to other people for up to 14 days. Kindle support MOBI, ePub, MS Word, Txt, HTML, PDF and other file formats. Your Kindle comes with its own email address. You can send word docs, text files, pdfs, images, downloaded articles and more to your device. All you need to do is attach the doc to your email and send it to your Kindle’s email address. The doc will show up in your reading list. Kindle owners get ads, lots of ads, on the lock screen of their device. You can opt out of device ads, but it costs an extra $20 to do so. To borrow library books, you need to use Overdrive and then send the book to your device. Kobo has a much simpler experience for borrowing books. Sending articles from the web to your device is much more challenging on Kindle than on Kobo. You can only get your books from Amazon. Here are Amazon’s 2019 eReaders in order from least expensive to most expensive. Anyone who just wants a simple e-ink device for reading can’t go wrong with the Kindle eReader. At just $79.99, this is the perfect choice for readers on a budget. One caveat of this tablet is that it doesn’t emit any light, so reading in low-light conditions won’t work. However, reviewers love that this Kindle looks like real paper and feels the closest to reading an actual book. One customer commented that “The Kindle is lighter than my iPhone 6s Plus but still feels sturdy. Reading on the Kindle looks just like reading on a book in my opinion, and you can easily adjust the font if you find the default font to be too small.” Although this eReader doesn’t feature as many bells and whistles as other tablets, it performs its main function perfectly: displaying books. The latest generation of the Kindle Paperwhite is fairly priced at $129.99 but has many added benefits over the base model. 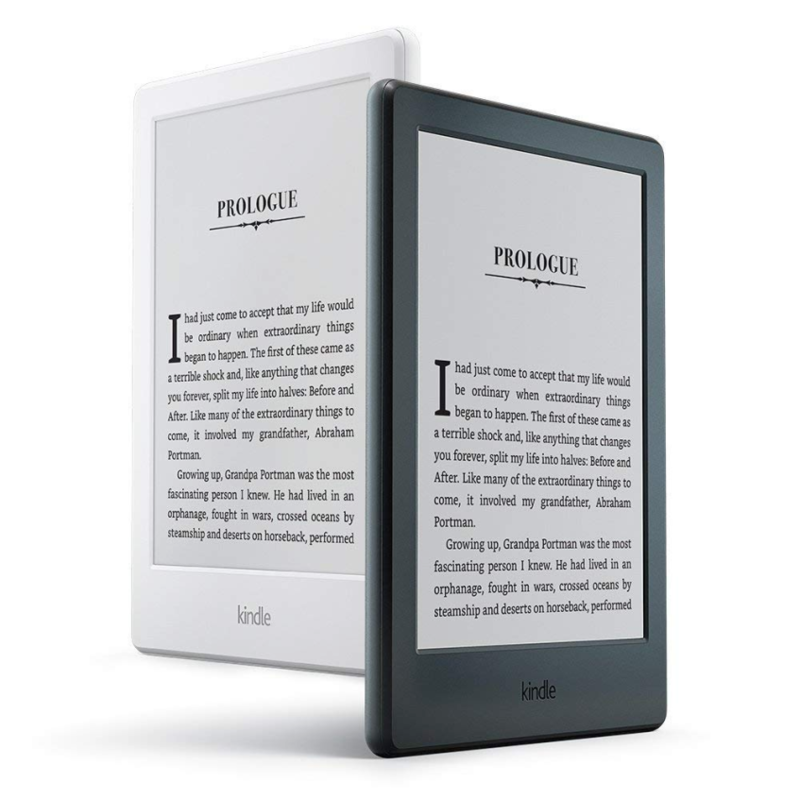 We like to call the new Paperwhite the “Waterproof Kindle.” It is waterproof up to 2 meters for 60 minutes in freshwater. Saltwater should be okay too, but you’ll want to rinse the salt water off ASAP. 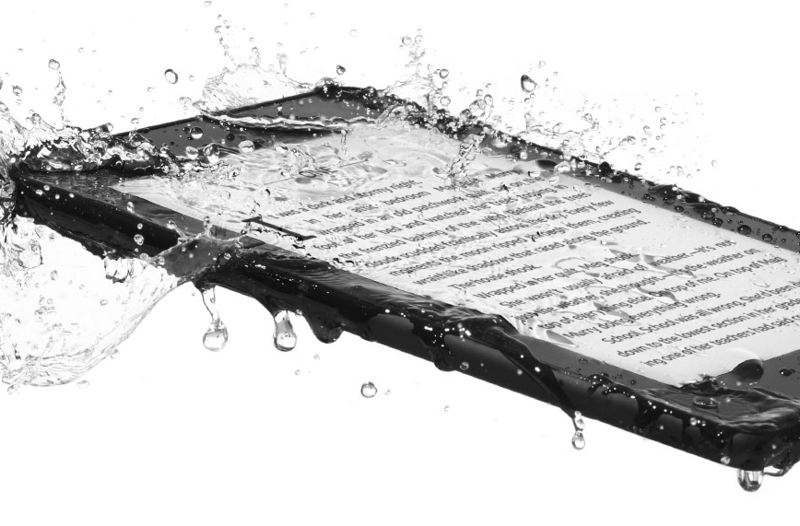 This waterproof tech unlocks a whole new realm of reading. Yes, you can now read in bathtubs, pools, hot tubs, boats, and while walking in the rain. The Waterproof Kindle is also extremely lightweight and thinner than its predecessor at 8.18 mm thick, and it weighs less than a paperback at just 0.4 lbs. It includes twice the storage of its predecessor and a single battery charge lasts weeks. It also features five LEDs and adjustable front light. You really can enjoy the new Kindle anywhere. One happy reviewer writes, “I am an avid reader and adore the new paperwhite! To me, it’s the perfect eReader.” Along with being waterproof, the 10th generation of the Kindle PaperWhite features a 300 ppi glare-free display and is backlit so you can read in any lighting condition. It’s thin and lightweight with a 6-inch display and is fully compatible with Audible so you can listen to any of your favorite novels. The new Paperwhite went on sale November 7, 2018, and it starts at $129.00 for the Wi-Fi only, low memory 8GB version. The 32GB version is $30 more, and if you want anywhere cellular connectivity that runs an extra $70.00. At $249.99, the Kindle Oasis is the priciest e-ink tablet that Amazon offers, but many agree that it’s definitely worth splurging on. 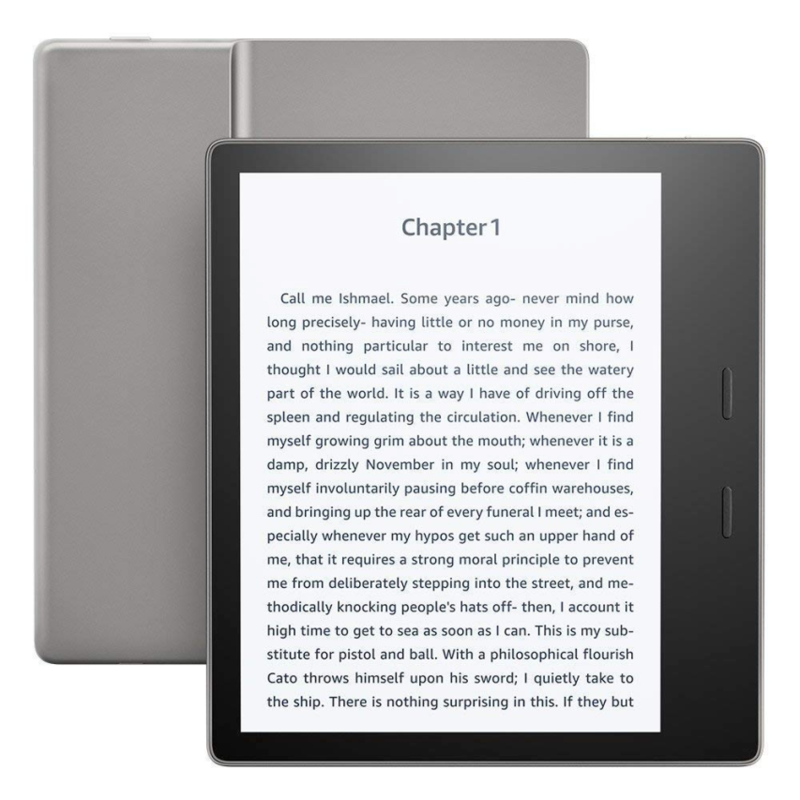 The Oasis has a larger display than the Paperwhite, and it has a unique front light that adapts to any lighting condition, so readers can easily enjoy their novels whether it’s the middle of the night or in bright sunshine. It’s ergonomically designed to be comfortably held with one hand. The screen even rotates so you can hold it in your left or right hand. And like the Paperwhite, the Oasis is waterproof so you can read by the pool or in the bathtub without worrying about dropping it in the water. The 32GB version with free cellular connectivity runs $349. 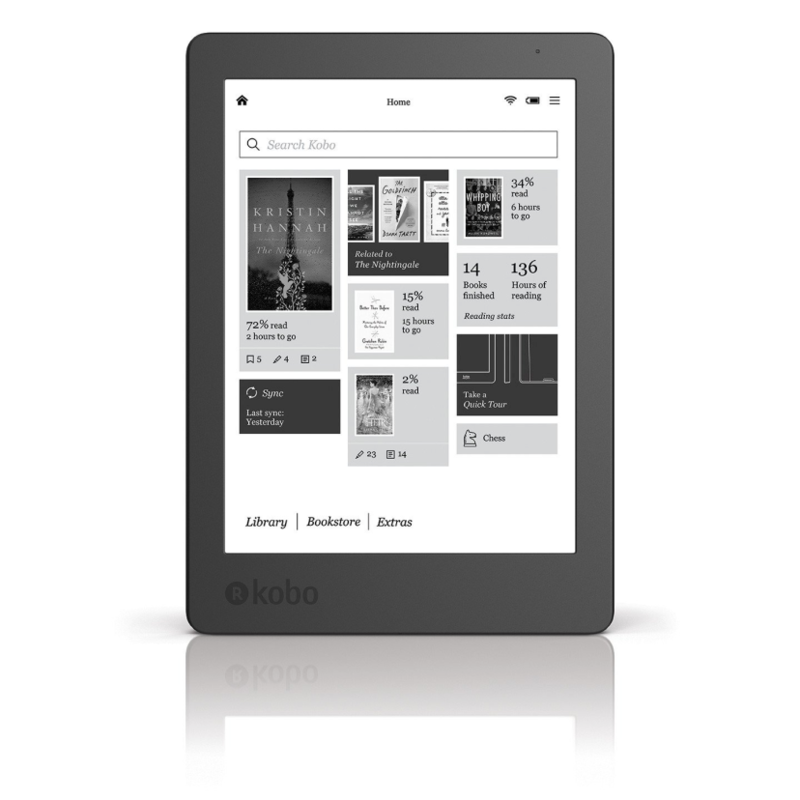 Kobo users can buy eBooks right from their device (as is the case with Kindle) or from countless places such as kobo.com, Walmart books, Google books, indie publishers, and even local bookstores in many different countries you cannot buy them on Amazon. If you love articles, but don’t love reading them online, Kobo offers a great solution. It’s called Pocket, and it lets you save articles and stories from websites and read them later on your KoboeReader. With Kindle, you can do this as well, but you need to connect an instapaper account to your Kindle. It’s not quite as easy or integrated as with Kobo. Borrowing library books on Kobo is so, so, so much easier than on Kindle. Kobo has integrated Overdrive right into the device. Meaning you can search and borrow books right from your Kobo. With Kindles, you can borrow books, but you need to use the Overdrive site or app to do it, and there some set up involved. Kobo claims to have 6 million titles on offer in the US, so you’ll be able to find books from all the major publishers except Amazon Publishing. Kobo likely has more foreign language titles than Kindle. Kobo also offers free books, but not nearly as many as Kindle. Kobo users don’t get any advertisements on their eReader lock screens. You can’t lend books to friends or family. There’s no “all you read buffet” program for $10 per month. You can’t send things to your Kobo via email; you need to sideload content to it by connecting it to your PC. You can’t get your books from Amazon. Here are Kobo’s 2019 eReaders in order from least expensive to most expensive. 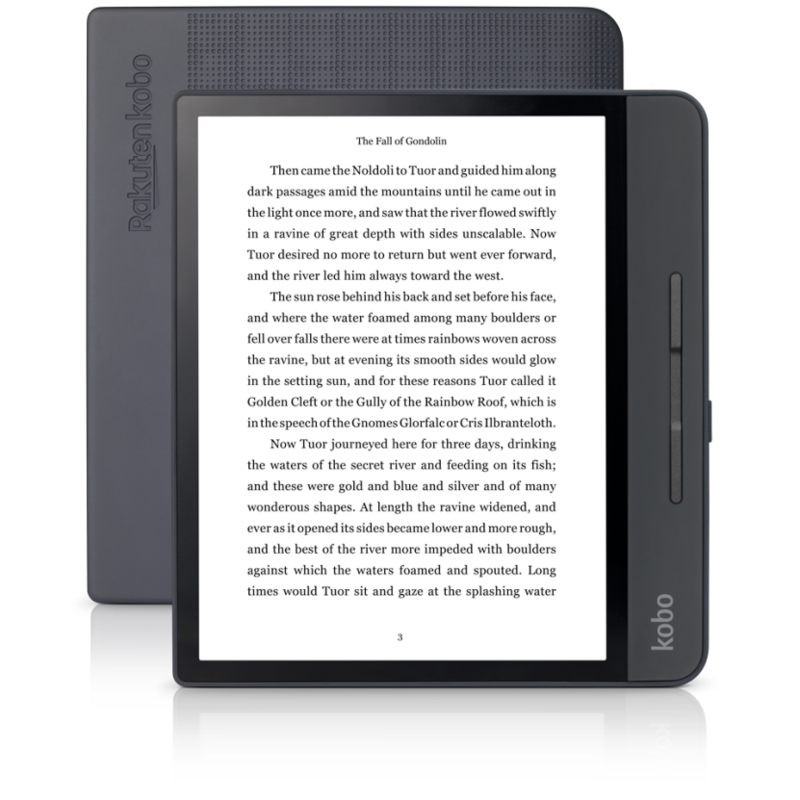 The compact Kobo Aura features a 6-inch display like the Kindle Paperwhite. It also boasts a battery life up to 2 months, and it can store up to 3,000 books. It’s reasonably priced at $119.99, and it has several tools for a customized reading experience, such as dozens of font sizes, 11 font types, adjustable margins, and the ability to highlight passages. Users can also write notes as they read and if they stumble upon an unknown word, they can access the built-in dictionary with just a tap. (Adjustable font size, highlighting, and word lookup are also standard on Kindle, but Kindle does not offer as many fonts or font sizes). 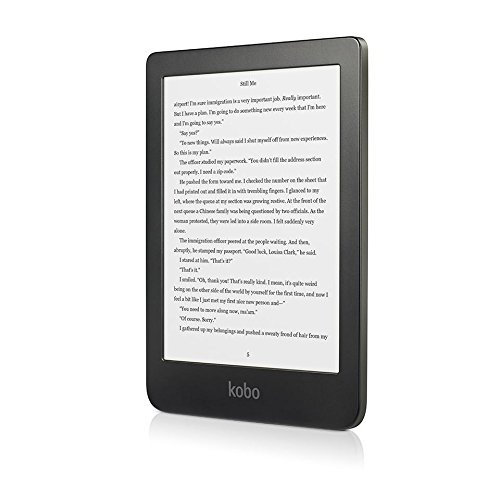 The Kobo Clara HD has 8GB of memory and can store up to 6,000 eBooks twice the amount of the Kobo Aura! This tablet is only slightly more expensive at $129.99 and one reviewer said it’s incredibly similar to the Kindle Paperwhite eReader, writing “There are a couple of key areas where the Clara HD has it all over the Paperwhite most notably, having double the eBook storage space, and the great degree of control it gives users over how fonts and pages are formatted.” And with no advertisements to distract you from your reading, you can get completely lost in your book. You love getting free books. You want to be able lend books to friends. You like to email docs to your Kindle. Borrow library books right from your device. Support your local bookstore by buying books from them. Send articles easily from the web to your device. Customize your fonts, font sizes, and margins.